Rory McIlroy birdies his 10th hole of the day following a long weather delay. Rory McIlroy has a running joke with his caddie. After six months “off” the season is only just beginning. In the weather-delayed opening round of The Barclays, the first of the four FedEx Cup playoff events, he played like a man still bothered by early season rust - but there’s not much grease that needs to be applied before the machine starts humming again. Three double bogeys would normally wreck a man’s card but in managing to shoot a level par 71 - thanks to an eagle three and four birdies - McIlroy looks close to launch speed. A pulled drive at the ninth, his 18th, bounced off a cart path and over a fence, out of bounds, leading to a double bogey finish. But he was far from downcast. “The first of those mistakes came on the par-4 15th, his sixth hole of the day, where he pulled his tee shot left and into the tall grass and then missed the green left on his next. McIlroy pitched back across and off the green before eventually two-putting from 6 feet for his first double bogey. “On the par-4 fifth he missed left again, this time yanking his approach shot from 162 yards into the water to set up the second double bogey. “He rebounded quickly by reaching the 514-yard par-5 sixth in two and making a 13-footer for eagle before pouring in a 28-footer for birdie on the following hole. But McIlroy missed a golden opportunity to keep the momentum going on the par-5 eighth, however, leaving his approach short of the green and then leaving himself 15 feet for birdie after at best a mediocre pitch. How soon McIlroy will begin firing on all cylinders is anyone’s guess. But it looks, as he would say himself, close. Graeme McDowell, meanwhile, did not hit the ball well but came back from two over par after five to match McIlroy’s level par 71 thanks to some solid putting inside seven feet. Stadler, meanwhile, leads by one from Ryan Palmer, the in-form Henrik Stenson and Camilo Villegas with Tiger Woods in a share of seventh following a bogey free, four under 67. Rory McIlroy endured the agony and ecstasy of Augusta as his dramatic charge up the leaderboard was marred by five dropped shots over the last three holes and a rules controversy that could still end in disqualification. 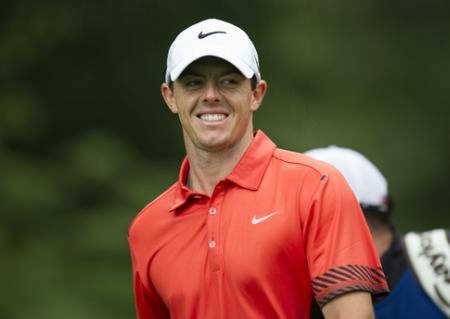 Rory McIlroy birdies the eighth in the second round of The Barclays. Darkness prevented him from finishing his second round but Rory McIlroy is seeing the light at the end of the tunnel again after firing a brilliant seven birdies in 16 holes in The Barclays at Liberty National. Rory McIlroy. Picture Anthony Powter/www.golffile.ieGraeme McDowell is projected to fall from 28th to 45th in the FedEx Cup rankings after missing the cut in The Barclays. But Rory McIlroy can still make a final round charge for the title despite another round sprinkled with errors. McIlroy frustrated by "stupid little mistakes"
Rory McIlroy makes birdie at his opening hole. At this pace, Rory McIlroy will hit top form by Christmas. Six birdies in his opening round in his defence of the Deutsche Bank Championship at TPC Boston was impressive. Unfortunately, he also had five bogeys in what he described a “sloppy” one under 70 that leaves him seven shots adrift of a stunning Phil Mickelson and England’s Brian Davis. McIlroy struggling: "I'm getting a little frustrated and impatient"
Rory McIlroy made three of his four birdies by holing from just off the green in the second round at TPC Boston. Here he holes from 18 feet at the ninth. Rory McIlroy made the cut by the skin of his teeth in his defence of the Deutsche Bank Championship after a double bogey seven at the 18th left him sweating all day at TPC Boston.